How many times do you check something on the internet but find you are drifting aimlessly from one link to another? If you can’t not answer the phone when it rings, and you spend hours a week on social media, and you read your texts instead of kissing your loved one goodnight, and you don’t give your kids proper attention because you just have to prioritize new responses to your tweet... then this book is for you. The digital world is spreading like an inferno – a swirling, hot storm of change, possibility, addiction, passion, manipulation, creativity and abuse. It demands our attention and encourages us to be always on, with its constant updates and feedback. It is exciting, but it can also be overwhelming. And it’s developing faster than our ability to deal with it. To adherents of digital living and working, any criticism is uncool, a sign of being out of touch. Refreshingly, Digital Inferno is neither simple indictment nor unqualified endorsement. Rather, it’s about holding your own in the digital realm – adapting in a healthy way to the new reality. It offers a conscious path that allows you to derive the benefits you need but also to manage the dangers. 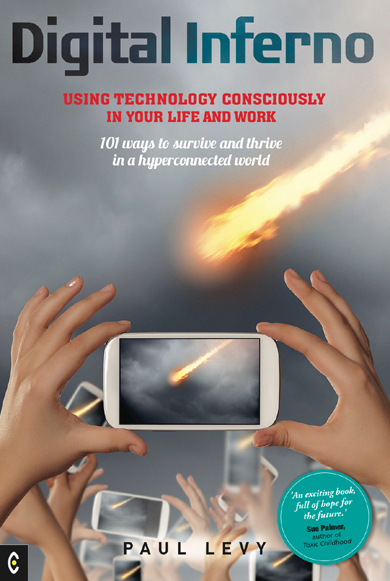 Packed with a wealth of practical advice, Digital Inferno describes numerous methods to enable you to step back from constant digital activity and virtual living, and to pay more attention to the real world. You’ll find exercises to overcome tiredness from digital contact and to develop skills to enable you to remain awake and aware. Crucially, you will be master of the digital realm: to abstain from contact when you need to, but also freely to immerse yourself when you choose to. We don’t need to shun new technology, but we do need to be armed with an understanding of its challenges, problems and limitations. This book provides the tools you will need to meet the future consciously. PAUL LEVY is a writer, facilitator and founder of digital publication FringeReview. He is a Senior Research Fellow at the Centre for Research in Innovation Management (CENTRIM) at the University of Brighton in the UK, and co-author of several books on innovation, technology and change, including E:Quality and Technosophy. Paul was Head of Interaction at the Digital Workplace Group, and has worked with the digital realm for over thirty years, using technology in the fields of business training and organisational theatre. He lives with his family in Brighton, England.